XMLBlueprint lets you work with files stored on remote servers using the FTP, SFTP and WebDAV protocols. To create a Server, select Servers... from the Options menu. 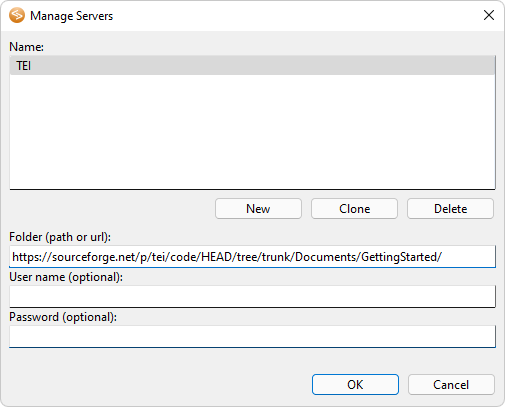 This will display the Manage Servers dialog, in which you can define a new Server or edit an existing one. Use the ftp:// prefix to specify an FTP server. FTP is an insecure protocol and is not recommended. Use SFTP or WebDAV instead. Use the sftp:// prefix to specify an SFTP server. Use the http:// prefix to specify a WebDAV server. If possible use SFTP which is much faster. Use the https:// prefix to specify a Secure WebDAV server. If possible use SFTP which is much faster.